Rockstar Energy OTSFF Yamaha’s Dillan Epstein rocked the heavy sands of Gopher Dunes in Courtland, ON this past Saturday with 1-4 motos, which gave him a well-earned second overall on the day. 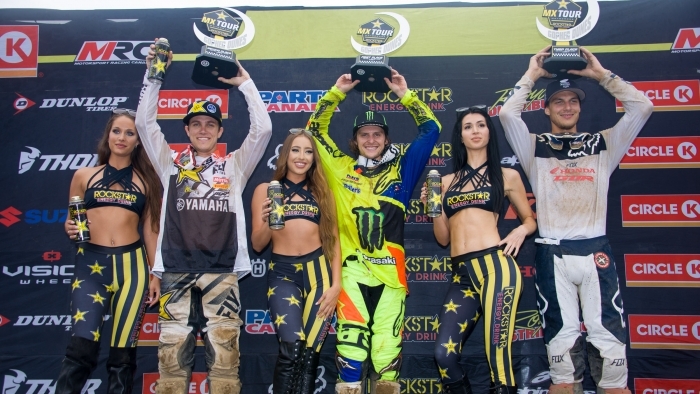 It was Epstein’s first moto win of the season and best overall finish so far this year. For his teammate, Matt Goerke, Round 6 of the Rockstar Energy Triple Crown Series MX Tour turned out to be less celebratory. Although he put in a phenomenal ride in the first moto, finishing second behind Epstein, moto 2 turned into a worst-case scenario for Goerke. A technical glitch put him on the sidelines after just five laps, which saw him finish in a distant 11th overall and a drop from second in the current points standings to fifth. Under threatening skies and a humid temperature of 29°C, the start of moto 1 was picture perfect for both Goerke and Epstein. They dove into the first turn side by side: Goerke nailed the holeshot, with Epstein in close proximity for second place. This came as no surprise as Goerke had already clocked the fastest qualifying time and Epstein second fastest. Although Colton Facciotti – who followed Goerke and Epstein in third place – stuck a pass on the duo by the end of the first lap, he was relegated back to third a few laps later. Not wanting to be left out, Epstein had accompanied his teammate as he made the pass on Facciotti. While Goerke and Epstein put on a clinic in a barnstorming battle for control of the lead, Facciotti found himself trailing them by some 11 seconds at the halfway point of the moto. The rest of the frontrunners even further back. Rain finally started falling in the closing laps, with thunder and lightening making their presence felt off in the distance. Goerke, who was out of tear-offs, had to remove his goggles, got roosted in the eyes by a lapper, which momentarily blinded him and caused him to crash. This opened the door for Epstein to take over the lead from a flabbergasted Goerke. The defending champion was able to quickly get back on his bike, however, and thanks to the huge gap between himself and Facciotti, was still able to cross the finish line in second place. Although, arguable Goerke would have taken the win ahead of Epstein, for team Rockstar Energy OTSFF Yamaha the 1-2 finish was as good as it gets. The rains, which had continued to fall during the women’s second moto, had ended by the time the second 450 Pro moto was staged. Thanks to the sandy nature of Gopher Dunes MX Park, the track was in good racing condition. The second 450 moto saw Goerke and Epstein off to a less auspicious start than in moto 1. They were again neck and neck but in sixth and seventh place respectively. Both riders moved ahead by one position within a few laps on their explosive YZ450Fs, knowing they had their work cut out to connect with the frontrunners on what is hailed as the toughest nationals track in the country. For Goerke, however, it was not to be: a mechanical gremlin sidelined him on lap five. This turn of events resulted in a drop for Goerke from a close second in the points chase behind leader Colton Facciotti to fifth place and facing a 30 points deficit. With three rounds left, this isn’t the end of the world but it certainly will make the amicable American’s quest for a fourth 450 Canadian National Championship title a bit more challenging. Epstein, meanwhile, would, despite moving mountains to connect with the frontrunners – who were each separated by quite a bit of real estate – finish the moto in fourth place. It was good enough for second on the overall podium, however, and strengthened his hold on sixth place in the points standings. The Rockstar Energy Triple Crown Series continues in two weeks on Saturday, July 28th, with Round 7 of the MX Tour at Riverglade MX Park in Moncton, NB.